The underlying dynamic of Ignatian prayer is that of a conversation. We are in a relationship with God that involves give and take, our response to his invitation, a sharing of life. The Spiritual Exercises urge us to see ourselves as God sees us—as sons and daughters, members of his family. Jesus used the affectionate word abba to refer to his Father when he prayed. The closest English equivalent is “Papa.” We can address God in the same intimate way because we are his children. Prayer is a natural outcome of this close relationship. Prayer is a conversation. The essential activity of prayer springs naturally from our humanity. It is a matter of conversing with a very good friend. From What Is Ignatian Spirituality? From the beginning of his spiritual journey, Ignatius had a good idea of what he wanted to do. He wanted to evangelize, to bring the good news of the Incarnation to others. He wanted to lead others into a relationship with Christ Jesus. How to accomplish this was less clear. It took years for him to develop the attitudes, insights, and techniques that we know as Ignatian spirituality. He made many mistakes along the way and wandered down several blind alleys. He was familiar with the work of the Dominicans—an order of learned clerics who specialized in the ministry of preaching. Ignatius admired good preaching, but this was not the evangelistic tool he was looking for. Ignatius was attracted to the Franciscans, who gave a powerful witness to the gospel through their poverty. But he did not think that humble itinerant begging was the direction God wanted him to take. Some spiritual approaches seemed too passive to him. They were based on reading books and listening to sermons and lectures. They appeared to say that God can be found through some kind of passive absorption of good will and good behavior. Ignatius practiced an active spirituality. He understood that people were actively engaged with work in the world. They had dealings with each other. They shared life with each other. This active sharing of grace and gifts and talents eventually became the how for his evangelistic ministry. Ignatius describes his ministry by the simple Spanish word conversar. Conversar means “to converse,” “to talk with.” Its simplest meaning in English is sincere talk with another person, the kind of comfortable, satisfying conversation whereby we truly get to know someone else. Ignatius must have been a master of this kind of conversation. He seems to have had an extraordinary gift for friendship. The first Jesuits were a group of men who were initially bound together by their affection and love for Ignatius Loyola. Conversar has broader meanings as well. It means “to be conversant with” something or someone—that is, to truly know them deeply. It means “to have dealings with.” To converse with someone is to know them and to be involved with their lives. In the Ignatian scheme of things, to converse is one of our ways of loving. Ignatius’s spiritual life developed around the idea of conversation. It is based on conversation with God in prayer. It is developed through conversation with others—spiritual directors, confessors, like-minded friends who share one’s ideals and way of life. It is expressed in conversation as ministry—sharing the gospel with others. All three conversations are embodied in the Spiritual Exercises. The retreatant is guided through the exercises by conversation with a spiritual director who cultivates the conversation with God. The exercises nurture a conversation with God. The goal of the Exercises is to help the person get involved in a more fruitful conversation with others in ministry. In fact, the Exercises themselves are the product of years of conversation. Ignatius developed them from his experience as a spiritual director of men and women seeking a deeper relationship with God. He would suggest ways to pray, scripture passages to meditate on, scenes to imagine, ideas to ponder. Then he and his friends would talk about what happened in prayer. Together they would discern how God seemed to be leading. Ignatius’s book, perhaps the most influential book ever written about developing our relationship with God, is essentially a collection of these exercises, sharpened and honed in conversation. The Spiritual Exercises are structured around the developing relationship between the retreatant and Jesus Christ. They urge us to see ourselves as God sees us—as his sons and daughters, members of his family. Jesus used the affectionate word abba to refer to his Father when he prayed. The closest English equivalent is “Papa.” We can address God in the same intimate, friendly way because we are his children. Prayer is a natural outcome of this close relationship. It is not something mysterious or esoteric or something that we learn how to do in school. Prayer is conversation. If we can talk, we can pray. Of course we can learn to pray better, just as we can learn to be better conversationalists. That, in fact, was Ignatius’s intention in putting together his Spiritual Exercises. But the essential activity of prayer springs naturally from our humanity. It is a matter of conversing with a very good friend. Consider what Jesus did when the disciples asked him, “Lord, teach us to pray.” Did these good Jewish men, who prayed five times a day (at least), really mean that they did not know how to pray? Hardly. They wanted to know Jesus’ way of praying. So he taught them the Our Father, which is the template of all Christian prayer. Jesus’ way of praying is more important than the words he taught us. We are personally familiar with God (“our Father”). We reverence him (“who art in heaven,” “hallowed be thy name”). We share God’s desires (“thy kingdom come,” “thy will be done”). We ask for what we need (“give us this day our daily bread”). We beg our Father’s protection (“deliver us from evil”). These elements of prayer cover the whole range of human conversation: sharing experience, saying thank you, asking for help, crying out in pain, begging forgiveness, expressing love, just spending time together. This is what we do when we get together with our friends. We do the same thing when we get together with God. Prayer takes many forms: mystical prayer, devotional prayer, liturgical prayer, sacred reading, moments of epiphany snatched from our everyday lives. All of it is included in Ignatius’s conversar. This is what is meant by the famous Ignatian motto “finding God in all things.” “All things” to Ignatius is the whole panoply of human drama—our relationships, our work, our strivings and failures, our hopes and dreams. God can be found in all of it. Found does not mean an intellectual exercise of perceiving the presence of the divine. It means engaging God in it, meeting him, dealing with him. It is matter of conversar—an intimate conversation and the interacting that takes place between family members who love each other. Excerpt from What Is Ignatian Spirituality? 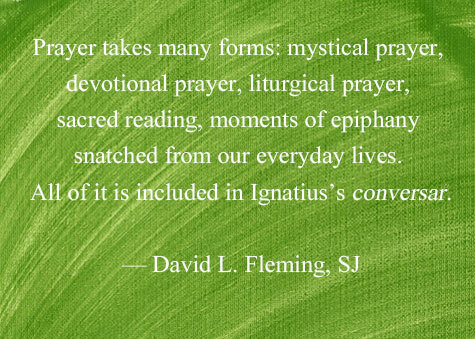 by David L. Fleming, SJ.